The State Board of Technical Education and Training ( SBTET ) of Andhra Pradesh, has released Notification for " AP Polytechnic Common Entrance Test -2017 ( POLYCET -2017 ) " for the candidates seeking admission in to all Diploma Courses in Engineering / Non Engineering/Technology offered at Polytechnics / institutions (including Aided and Unaided Private Polytechnics / Institutions running as 2nd shift in Pvt. Engineering Colleges) in Andhra Pradesh State for the academic year 2017 - 2018. Candidates who completed SSC Examination 2016-17 or equivalent from a recognized board, those candidates can eligible for apply Polycet-2017. Interested and eligible candidates may submit their application form through online. Candidates just visit AP Polycet 2017 official website and submit their application online. SBTET has providing all instruction about Fill details in the Application Form,Upload Photo & Signature ,Pay Application fee, Download Admit Card ( Hall Ticket) through official website. 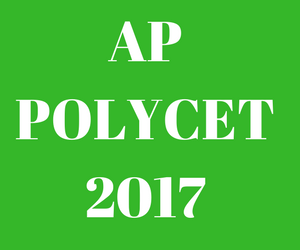 How to apply AP POLYCET -2017 online ? Interested and eligible candidates can Visit AP Polycet -2017 official website https://polycetap.nic.in and submit their application, and pay Examination fees through online. candidates also check their AP Polycet 2017 application status through this portal.